“I won’t fight anybody or even dream of battling anybody. If anybody allows the devil to use him, the same that advised you to make a mistake will laugh at you when you cry over the error.” This was a clear suggestion that the devil was using his boss, the Diocesan Bishop of Enugu, His Lordship Calistus Onaga, against him, Mbaka and the Adoration Ministry. Rev Fr. Mbaka further spoke with a touch of vanity about how he single-handedly built the Christ the King Parish, Enugu, with proceeds from the sale of his music albums. This priest is certainly special. He objects to suffering even if the Lord Jesus Christ, whose disciple he is, is the embodiment of sacrifice and suffering. He talks about assets in a capitalistic sense, and yet his reputation rests on his commitment to the poor. He finally says he accepts the “suffering”, sounding like a victim. Mbaka’s melodrama was nothing short of an act of protest and incitement. It didn’t take long before a mob-like group trooped to the GRA, Enugu to help him move his things to the new church where it is said he will be an assistant priest. If his followers had laid their hands on the Diocesan Bishop, only God knows what they would have done to him for allegedly demoting their hero. It also didn’t take long before the spokesperson for the All Progressives Congress (APC), South-East Caucus, Osita Okechukwu issued a statement alleging that Mbaka was being victimized because he is pro-Buhari and pro-APC. Okechukwu‘s intervention was a needless busybody act. He only stopped short of asking the Diocesan Bishop to reverse himself or get labeled as an enemy of the government of the day. Nor did it take long before the Catholic Church also put its feet down, staing clearly that no priest is above the Church. Mbaka definitely needed that reality check. But he had succeeded in politicizing his transfer and dragging the Catholic Church into mainstream, partisan politics with the Church holding the short end of the stick. It is perhaps for this reason that the Catholic Bishop of Abuja Metropolitan See, Cardinal John Onaiyekan once asked that Rev. Fr. Mbaka should be sanctioned. He actually accused him of talking “rubbish” when he openly condemned President Goodluck Jonathan and insisted that the electorate should vote for Muhammadu Buhari, then Presidential candidate of the APC, who according to him, was destined to win the 2015 Presidential election. He has also since the 2015 elections, made a high profile visit to the Presidential Villa to see President Buhari. He was actually shown arriving in a private jet, waving to the crowd as if he was on a Papal visit to the seat of power! How did one priest, out of over 30 million Nigerian Catholics, become so powerful and untouchable? Rev Fr. Mbaka’s seeming invincibility lies in his significance and relevance. His Ministry is a loud comment on the relationship between the Church and the congregation. Mbaka is the founder and Spiritual Director of a Ministry within the Catholic Church known as Adoration Ministry Enugu Nigeria (AMEN). Gifted, creative and clever; he is without any doubt a liberation theologian. He runs a prophetic church, a church that believes strongly in the power of the Eucharist, and which in every sense is a church of the poor. His source of inspiration must be those liberation theologians and other radical priests who have proven that for the church to be relevant, it must be relevant to the interests, concerns and expectations of the congregation, particularly the underprivileged poor. 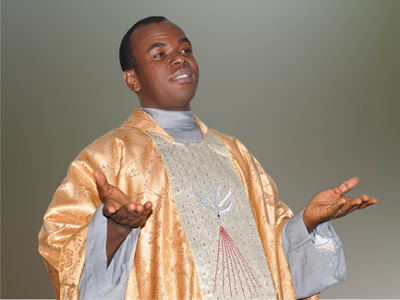 More than any other catholic priest in Nigeria, Mbaka has taken the Catholic Church beyond the confines of liberal conservatism to the ordinary man in the market place. He speaks the poor man’s language, he appeals to their imagination. He is the bridge between the Pentecostal churches and the Catholic Church in Nigeria. He has mastered the tricks, the rhetoric, the antics and the persona of the former, and he applies this with a touch of sassiness that is original. He urges members of his ministry to “Pray Until Something Happens” (PUSH). In an overtly religious and superstitious country like Nigeria, there is never a shortage of persons who are ready to push until the impossible happens. He organizes vigils titled “E no dey again”. That is precisely what the people want to hear. They want to hear that problems, disease, unemployment- “e no dey again!”. Mbaka also has a Foundation, the Multi-Life Savers Foundation. Note the emphasis on the saving of lives! He pays hospital bills, he gives out cars, he builds houses for people, he pays school fees, he sponsors events. He sings. He dances. He is not your typical Catholic priest. He is rich. He talks about assets. Other priests go to him for financial assistance. He is an all-round entrepreneur in church garments. His Ministry performs miracles, signs and wonders. He makes the lame walk, he opens the eyes of the blind, he cures diseases; he spreads wealth and opportunities. He creates jobs. He provides hope. With all this, Fr. Mbaka is far ahead of his bosses within the Catholic hierarchy. Persons of other faiths and Christian denominations troop to his Ministry to seek spiritual counseling. Politicians seek his endorsement. He controls the mind of multitudes. The Catholic Church is probably in need of reinvention, and the seeds of that process may well lie in the example and eclecticism of Mbaka and his likes in other parts of the Catholic world. Hubris is risky and pernicious. It is what makes Fr. Mbaka appear so contradictory. It is what has distanced him from his original vows as a priest, making him talk of cash and assets as if he were an investor on Broad Street. It is what makes him complain of suffering and see his transfer as a punishment, rather than as an opportunity for further evangelism of The Word. He must have started out as a humble priest, but today, he has mastered the use of the media for self-projection and he is not contented with being a priest, he is now enjoying the life of a celebrity, hugging the limelight, seeking personal glory. He runs a ministry of miracles, of wonders and signs and he sees visions of possible assassinations, either of himself or the politicians that he supports. No one should be surprised if this Pentecostal Catholic priest goes about with bodyguards. He shares this hubris with many other religious figures who seek to share power with politicians and co-govern Nigeria. They see visions about everything: from elections to diseases and foreign exchange rates. They have created a New Order under which they command the electorate, political parties and governments.